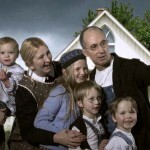 The most iconic of all American paintings, American Gothic, was the inspiration for another of our short painting/technology inspired video sketches. 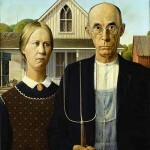 American Gothic was painted by Iowan artist Grant Wood in 1930. The painting was inspired by an actual house in Eldon, Iowa which was white painted and built in the ‘Carpenter Gothic’ style of architecture. Interestingly, this beautiful house still stands and is open to the public – click here for The American Gothic House Centre web site. What I particularly love about the painting is the dislocation between the two people – they appear both intimate and alienated at the same time. Apparently Grant Wood painted the man (his dentist) and woman (his sister) on separate occasions which has helped to create that uncomfortable sense of dissonance. Unlike the Mona Lisa, finding or re-producing the clothes for American Gothic was quite straight forward. We decided to use vintage clothes as much as possible, so I only had to make the white-collared black dress and the distinctive brown pinafore. I based the black dress on an original 1930’s dress that I had previously created a pattern for, I just added long sleeves and the little white collar. The pinafore was a little more difficult. I wanted to find an American source for the style rather that rely on what could be found locally (Lincoln, England). I contacted Diana Shonrock of Iowa State University who kindly supplied me with a series of images of typical 1930’s pinafores which looked very similar to the painting, including the use of ric-rac trim. I also located a number of 1930’s photographs of rural Iowa to use as a guide. Jessica Strom, the Administrator of the American Gothic House Center, was also very helpful, guiding me to other paintings by Grant Wood which might further illuminate the details. The problem of matching the pinafore fabric was also solved by Jessica, as she supplied me with a recreated swatch of the print and suggested a company called Spoonflower, who create custom fabric, to reproduce it for me. The resulting fabric was brilliant. Jessica also supplied us with photographs of the Gothic House in exchange for the completed black dress and pinafore, a deal which suited us and our low budget project well. The cameo brooch we used was lent to us by an American friend, the brooch was her mother’s and so it was roughly the style and period we wanted. As I couldn’t match the man’s shirt exactly, I found an original 1930’s plain white shirt and drew the stripes on with tailors chalk! The gentleman’s glasses were more difficult though. Although there are plenty of pairs around from the 1930’s they often had strong prescriptions (which would have distorted our model’s eyes) and were usually fairly small. The pair we used was the largest we could find, but they were still a little tight to the face. We also had the prescription lenses replaced with plain lenses.